This hairless perennial wildflower can reach a height of two metres but more commonly grows to about a metre tall. The ridged stems are hollowand often tinged with purple. 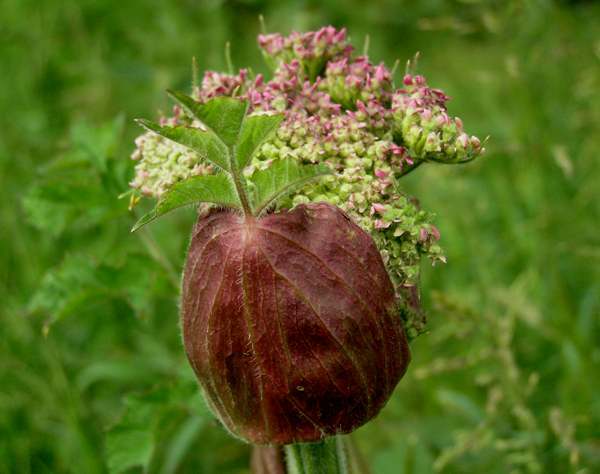 The developing umbels of flowers emerge from inflated sheaths. White or more often pale pink, the individual five-petalled flowers are typically 2mm across. Angelica sylvestris is common and widespread across Britain and Ireland apart from very dry regions in the south east, where it is only an occasional find. This plant is native to Europe and Asia and is found also in eastern North America, where it is considered an invasive weed. 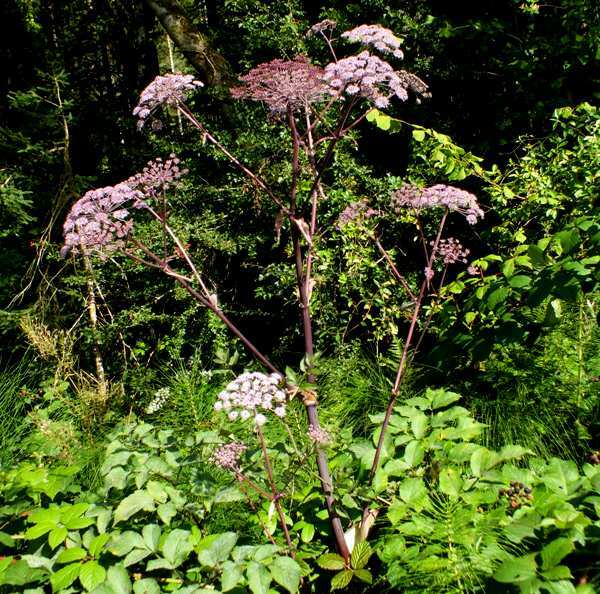 Wild Angelica grows in damp places, and in particular beside lakes and streams. In Britain Angelica sylvestris blooms mainly in July and August, although in sheltered sunny locations flowers can appear from early June onwards. This summer-blooming member ot the Carrot family (formerly known as the umbelliferae) is closely related to the garden plant Angelica archangelica that is used for culinary purposes - indeed, until the 20th century Wild Angelica was widely used as a vegetable. 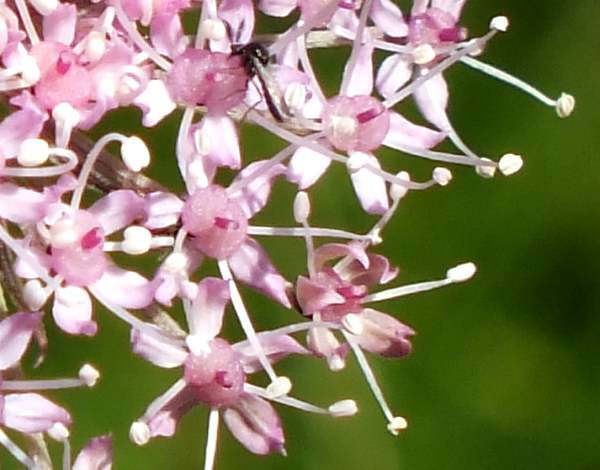 The purplish stems and bracts Wild Angelica are almost hairless, which helps distinguish it from the rather earlier-flowering Hogweed Heracleum sphondylium. Angelica, the genus name, means angelic - like an angel. The pure white flowers of some umbellifers in this genus may have been the inspiration for choosing this particular name, but usually Wild Angelica flowers have a lilac tinge. The specific epithet sylvestris often implies 'of the woods', but in this instance it is used in an alternative sense to denote 'growing wild'. 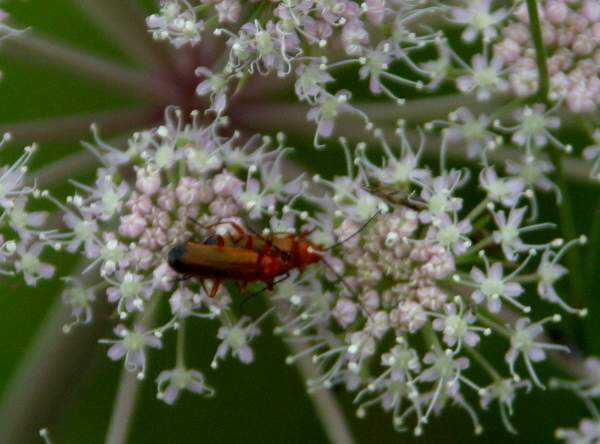 Soldier Beetles are among the many insects attracted to the flowers of this wetland umbellifer. The busy couple pictured above were seen beside a mountain stream in West Wales.